This week I had a call from a fellow birder asking me if I had been involved in observing and identifying an Hepatic Tanager this past summer near Prince Albert. This particular tanager is an uncommon summer resident of the pine forests in the mountains of Arizona and adjacent areas let alone Canada. This sighting near Prince Albert is only the second in Canada and the first in Saskatchewan. I informed my friend that I had not seen the Saskatchewan bird but that I had seen an Hepatic Tanager in the Madeira Mountains of southern Arizona. Meanwhile reports have come to my attention of other rare or uncommon bird sightings in our area. A Black Headed Grosbeak was seen in the Yorkton area this past summer. I have seen quite a few of them in the US but my most memorable sighting was of a spring male singing away in the poplar tree in our backyard. Its song is a mellow version of the Robin's. Another bird sighting of interest was of a pair of Barred Owls in the Madge Lake Area. These eastern forest owls have slowly spread westward along the Boreal Forest and similarly treed areas farther south. 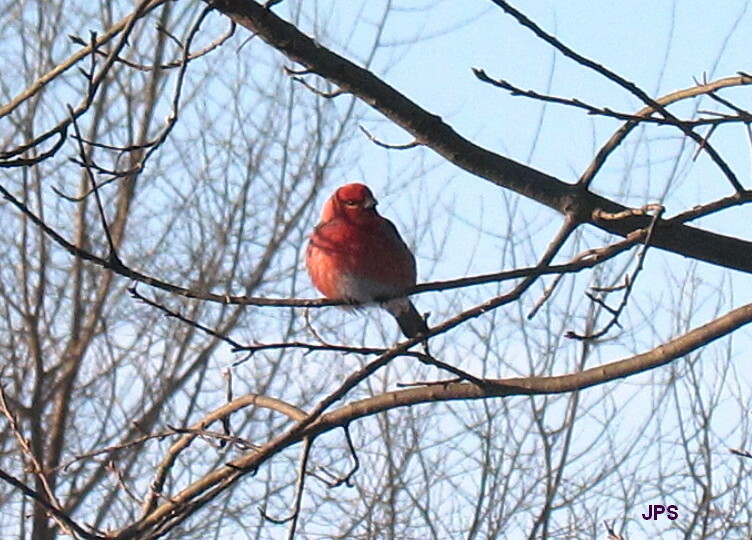 The last of the rare birds that has been brought to my attention is the Rosy Finch. The sparrow-sized Rosy Finch is a bird of the Rocky Mountains where it lives and breeds along the snow line in the summer. Occasionally during extremely harsh winters they will spread out over the plains usually in close proximity to the US/Canada border. 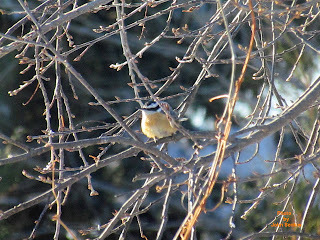 In Saskatchewan they are most commonly seen in the Cypress Hills region but, recently one was seen in the Yorkton area. I have been fortunate enough to see them in both Banff and Jasper National Parks but not locally. A word of caution when identifying rare birds. Make sure that you have a good quality bird book, a knowledgeable witness and, if possible, good quality pictures. Wishing to see a rarity often creates an exotic bird out of a common one. Recently, I have had several local people tell me that they never realized that nuthatches lived around here and that they did not know what nuthatches looked like. There are two species of nuthatches around here, the Red Breasted and the White Breasted. Both birds have the unique habit of feeding upside down as it were. Their feet are designed to allow the nuthatch to climb down trees head first and when they come to feeders they tend do the same. The more common one is the Red Breasted. 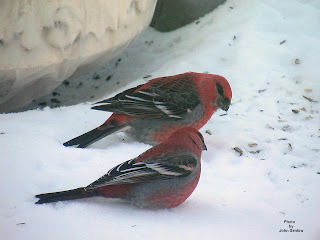 We have a pair regularly at our feeders and I am sure that other yards with feeders have them too. Although common in towns in the winter they disperse into rural areas during the summer for breeding. Both birds somewhat resemble chickadees with the Red Breasted a little more so and an inexperienced birder would probably identify it as a chickadee. 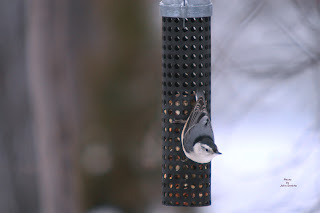 The easiest way to identify nuthatches is by their unique feeding habits. A second characteristic is the flight pattern. Most birds fly directly from one point to another but not the nuthatch. It often takes off in one direction only to change direction several times in mid flight. It reminds me of the flight pattern of a butterfly. As far as field marks go it is the easiest to consult a bird book. In size the Red Breasted compares to a chickadee while the White Breasted compares to a sparrow. This week I have included pictures of both nuthatches. The picture of a Red Breasted Nuthatch sitting in a tree was taken two weeks ago while the picture of a White Breasted Nuthatch feeding was taken two years ago. Both were taken in our backyard. I just got a phone call from Weslaco, TX where we have spent the last six winters. At 10:30 AM the temperature there was 24C compared to the -18C it was here at the same time. I have to admit to being a little envious. Not only did I miss the nice temperatures but I also missed the local birds that go with it. Oh well, maybe next year. Texas birds notwithstanding, we do have quite a nice variety of birds here even in the winter time that are every bit as colourful and enjoyable as the more southern ones. This year we have had quite a wide variety of regulars as mentioned in previous articles. Our most recent arrivals, an irruptive (visits sporadically) species, have been the Redpolls that some winters do not show up at all. 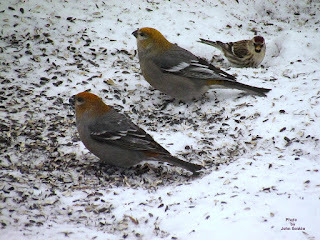 Usually when we have Redpolls at our feeders we have about two dozen birds or so; this year only six or seven show up. Maybe more will come as the winter progresses. As always they prefer Canola seed something that other birds avoid. The upside to eating Canola is that the smallish Redpolls do not have to compete with larger birds for food. There is a definite "pecking order" among birds that in human terms we would label as "bullying". All irruptive birds are not irruptive to the same degree. Some like the Evening Grosbeak appear once in several years or even decades; others like the Bohemian Waxwing appear several times in a winter. 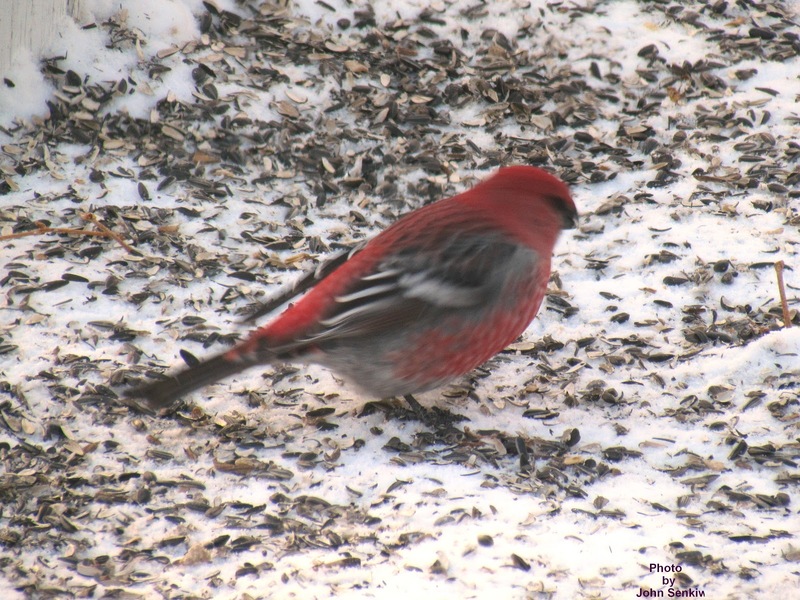 Most irruptive species like the Redpolls and Pine Grosbeaks often become regulars at our feeders if everything is to their liking. Others like the Bohemian Waxwings never become regulars. The only hope is to have some fruit trees with fruit still hanging on over winter to attract them from time to time. A side benefit is that an occasional summer resident that stays here for the winter instead of migrating south has something to eat. We have had Robins well into November this year feeding on the fruit of ornamental crab apples. One of the most popular trees for irruptive fruit eating birds is the Mountain Ash or its very similar European cousin the Rowan Tree. In most years both produce massive amounts of bright red edible berries that birds seem "to die for". The only noticeable difference between the two trees is that the Ash grow to about 5 - 6 metres while the Rowan Tree grows to about twice that. I have seen both species in Foam Lake. This week's picture is of a flock of Bohemian Waxwings taking a break between feeding sessions at our neighbour's Mountain Ash trees. They were sitting in our Poplar Tree like little soldiers all at the same angle facing in the same direction except for the odd nonconformist. 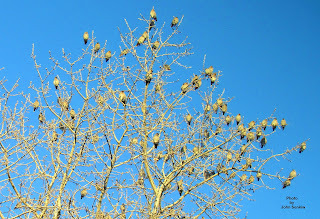 A flock of Bohemian Waxwings can be safely identified by the way the flock lands and sits in a tree. 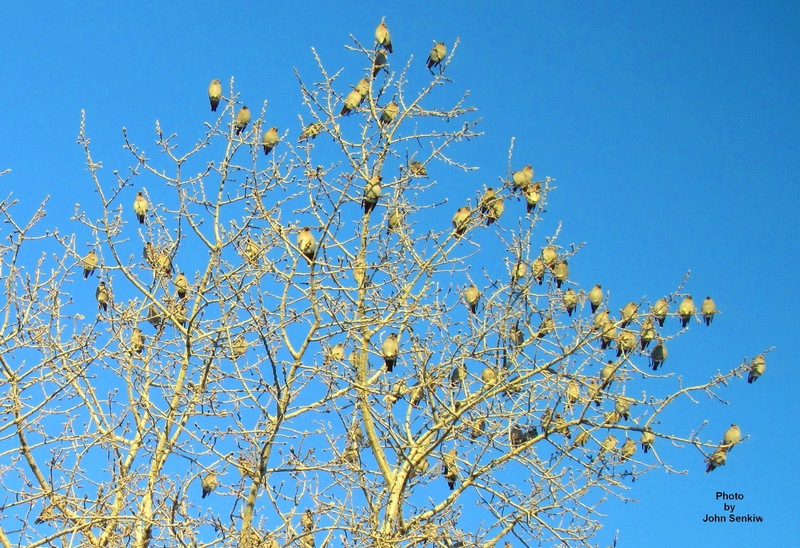 This week's picture is of a flock of Bohemian Waxwings in a Poplar in our backyard. After a week of dreary weather the sun has finally come out. None too soon for my tastes. If nothing else, the bright sun lets me get much better photos of birds. 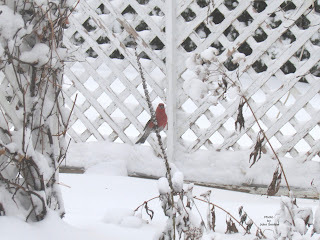 During the week of interminable clouds and snow our bird feeders were the site of continual feeding frenzy. 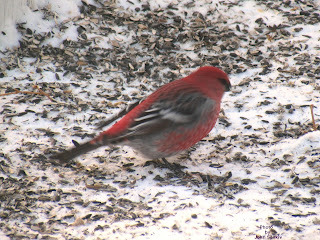 Even Pine Grosbeaks which are usually hesitant to come to our feeders were competing for seeds with a horde of House Sparrows. In addition, we even had a pair of Juncos that had not yet migrated south. Finally, we simply had to stop filling our Black Oil Seed feeders for almost a week. Once the feeders were filled again our resident half dozen House Sparrows returned but the fifty or sixty that were here before did not. They probably found other feeders in town. It was amazing at how much oil seed those sparrows could go through in one day. Our peanut and suet feeders were busy also but not to the extent that the Black Oil Seed feeders were. These feeders had the usual mix of regulars such as the Red Breasted Nuthatches, Chickadees, Downy and Hairy Woodpeckers and, yes, House Sparrows. 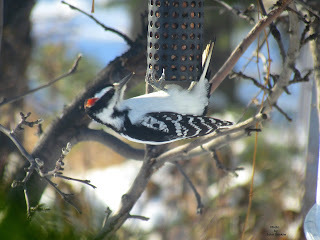 I managed to get an excellent photo of a male Hairy Woodpecker acrobatically feeding on peanuts on our first sunny day. In addition to feeders, we also try to make our yard bird friendly as it were by selecting plants that provide birds with food into the winter. For example, every year we plant sunflowers and leave them in the garden over winter and not removing them until spring. The birds not only eat the seeds but the small mites and insects that are hibernating in the plant itself. 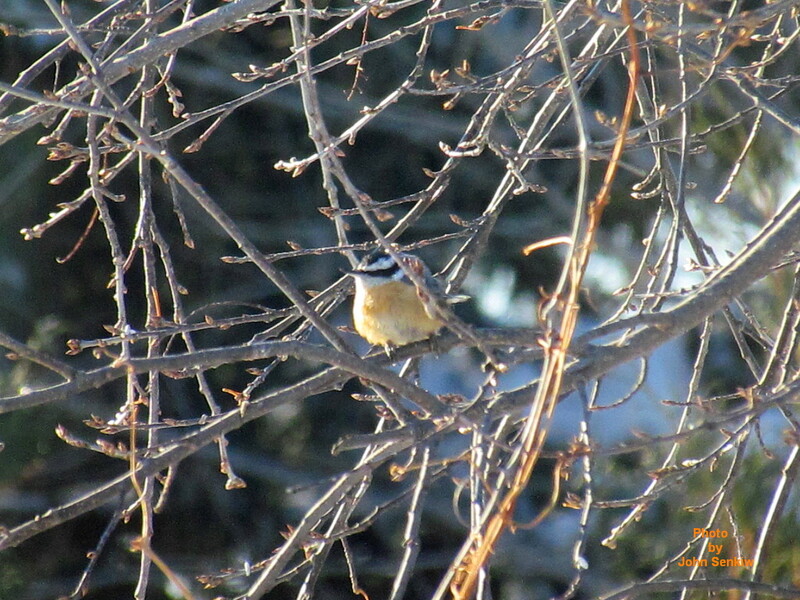 In our yard chickadees are forever clambering about the dried out sunflower stalks looking for insects. My wife also has a fairly large planting of domesticated native plants. Because the plants are domesticated they produce bigger and better flowers than their wild ancestors but to the birds this is not an issue. They are simply native plants. Overall, it is a win, win situation for both birds and us. Some of the varieties include Delphiniums, Bee Balm, Joe Pye Weed (Milkweed), Thistle and Verbascum (bee plant). 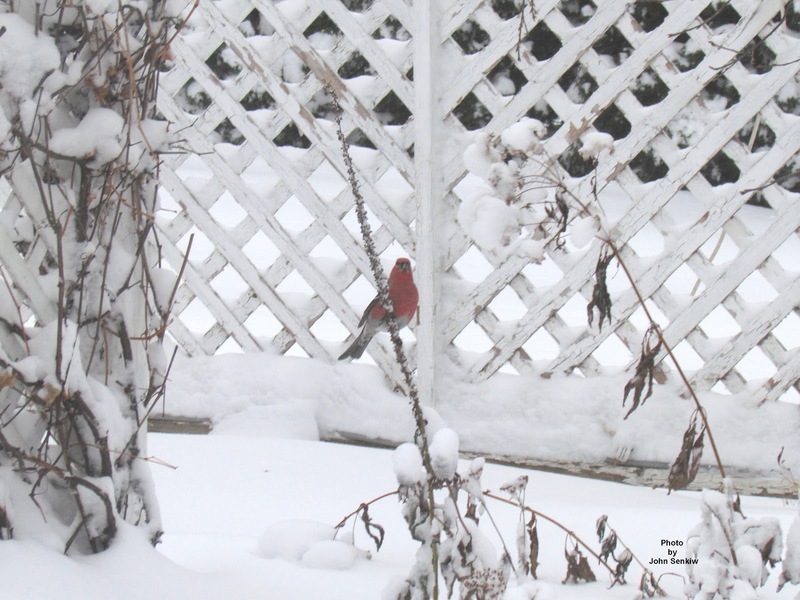 The second photo of a Pine Grosbeak on a Verbascum stalk was taken during the stretch of overcast skies and snow. I just missed getting some pictures of a pair of Redpolls feeding on the thistles. With the recent snowfall it seems that winter is finally here. However, the snowfall was relatively light and with warmer temperatures on the horizon the snow might just disappear. Having winter delayed is alright with me. During the several days of intermittent snow squalls our feeders were very busy. Some of our "old friends" like the Downy and Hairy Woodpeckers preferred the peanut feeders. Others like the Pine Siskins (which should have gone south by now) and chickadees fed on the black oil seeds. Still others like the Pine Grosbeaks and Bohemian Waxwings just dropped in but never fed on anything. 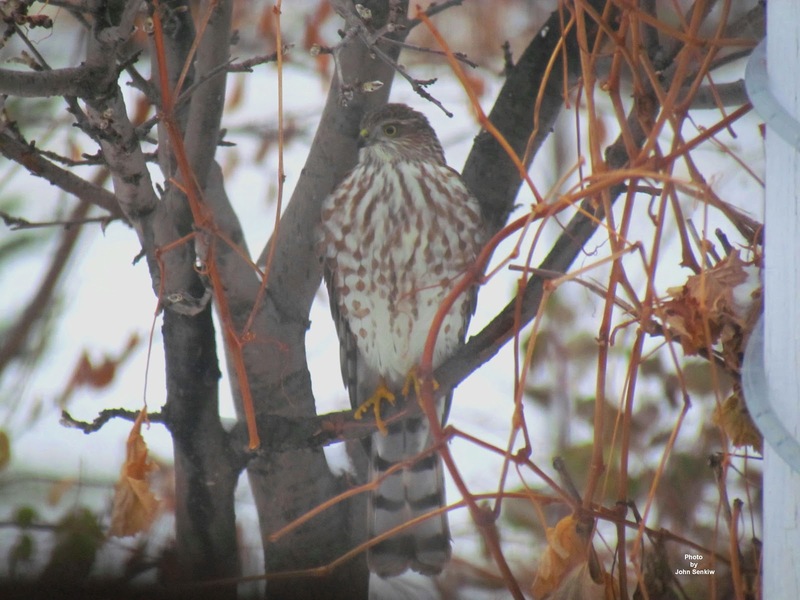 This week we had another infrequent visitor, the Sharp Shinned Hawk. The "sharpie" was very interested in the birds at our feeders and probably would have had lunch if the birds were a little more cooperative. When the hawk appeared the other birds disappeared. However, if nothing else, hawks are patient and persistent. On the sharpie's third visit in three days it was perched quietly in an apple tree about five feet from the peanut feeder. Meanwhile, my wife and I were observing a Hairy Woodpecker on a power pole just across the back alley from us. Suddenly, the woodpecker decided to come to the peanut feeder filling us with anticipation of an attack by the sharpie. As the woodpecker was about to land at the feeder it noticed the hawk. The hawk barely moved but the woodpecker aborted the landing and flew back to the power pole in an awful hurry. Why the sharpie did not attack is puzzling. Anyway, the Hairy Woodpecker did return later to eat some of the peanuts at the very same feeder. After the woodpecker incident the hawk still maintained its vigil from the same perch until a small flock of Pine Siskins flew in for some black oil seeds. Several siskins landed at the feeder and one landed in the apple tree not far from the sharpie. Suddenly the hawk attacked scattering siskins all over the place. We were not able to determine which siskin was singled out but after a brief chase of only a few seconds the hawk landed without any bird in its claws. The sharpie was a juvenile and from what my wife and I observed it was not a very proficient hunter and would require quite a bit more practice to hone its hunting skills. In either a colour or black and white photo a juvenile and adult are easily separated and identified. In colour the adult is slate grey with an orange barred breast and belly; the juvenile is brown with brown stripes on a white breast and belly. In both the lower belly is white. In black and white photos the adult breast and belly is barred while the juvenile is striped. (Stripes run up and down; bars run crosswise). In real life the sharpie can easily be confused with its close relative the Coopers Hawk. 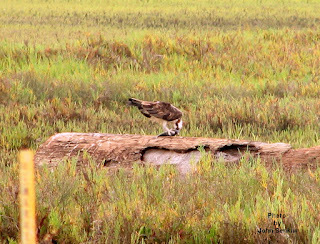 Although there is a size difference the two hawks are almost identical in appearance and often cannot be safely identified in the field. All differences are subtle to say the least. One of the better field marks is the shape of the tail. The tip of a Coopers Hawk's tail is clearly rounded; the sharpie's tail is square or slightly notched. 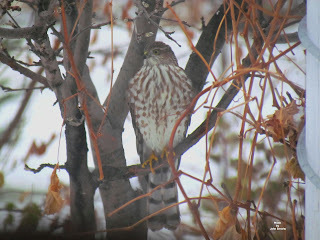 In the photo of the juvenile the tail is shown to be slightly notched thus confirming that it is indeed a Sharp Shinned Hawk. The photo of the adult shows the breast bars. Although the weather was gloomy and overcast I still managed to get some good shots of the juvenile sharpie. Note the tail shape and compare to that in a good bird book. 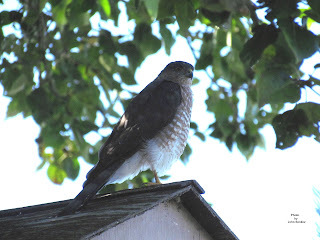 The photo of the adult perched on the martin birdhouse was taken two summers ago. It has been awhile since my last article but surgery and subsequent recovery have caused me to delay my efforts in this regard. Things are still going to be sporadic for awhile but I do hope to get into a routine in a month or so. In the last several weeks there has been a flurry of bird activity in our yard. 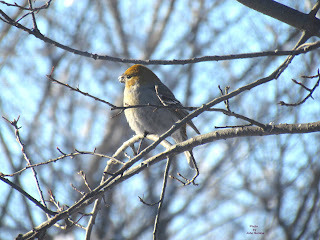 There have been the usual White Crowned Sparrows, White Throated Sparrows, Pine Siskins, Juncos, Chickadees, Red Breasted Nuthatches and House Sparrows to name a few. 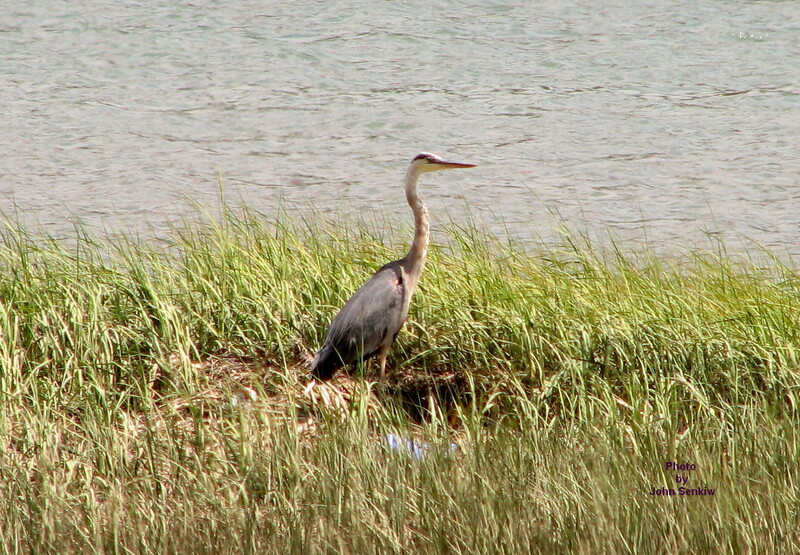 At the same time there have been an unusual number of uncommon (not rare) birds also. These include Hermit Thrush, Fox Sparrow, Blue Jay, Red Crossbills and Ruby Crowned Kinglets. 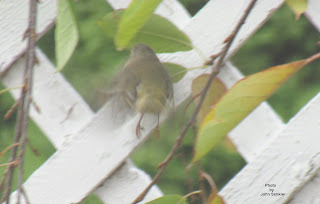 I wanted to get a picture of the Hermit Thrush but was unable to do so. My wife though managed to get a couple of decent shots of a pair of Ruby Crowned Kinglets feeding in our chokecherry tree. The process was quite difficult as the birds were constantly in motion and before they could be zeroed in the range finder they were gone.. To add to the problem the day was heavily overcast which caused focusing problems as digital cameras need good light to get crisp pictures. 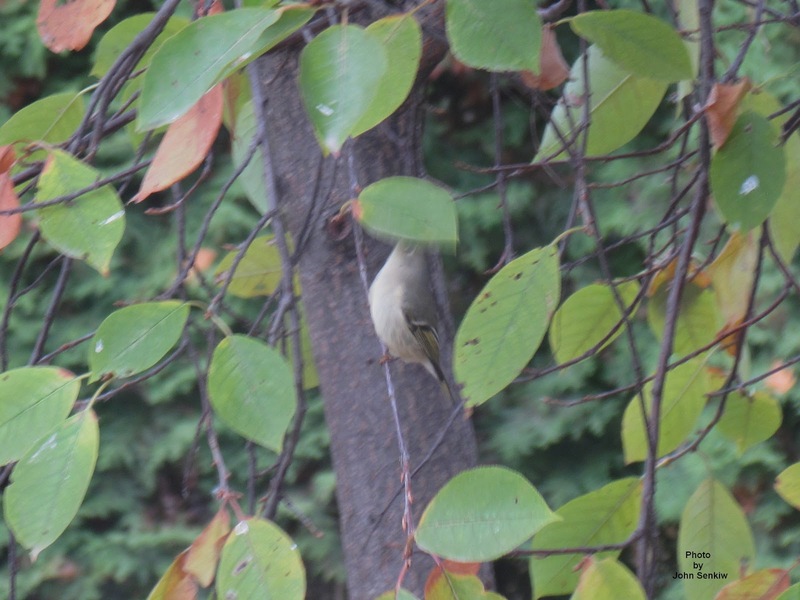 There are two kinglets in Canada, the Ruby Crowned and its smaller cousin the Golden Crowned, and both are present in our area. They are related to Old World warblers and are our smallest of birds save for the hummingbirds. The Golden Crowned is more of a conifer lover and can be seen in our area during spring and fall migration. 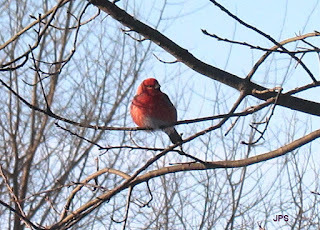 On the other hand The Ruby Crowned has nested right in town in the mature spruce trees by the RCMP station. When my wife and I went on our evening walks we would stop there and listen to the male sing. What is so extraordinary about its song is the sheer power of it for so small a bird. Upon first hearing it one would expect to see a bird about the size of a robin. Because of its diminutive size and green colouration the kinglet is hard to spot in a tree and the song seems to emanate from the tree itself. Although rather nondescript it does have one field mark that readily separates it from similarly coloured warblers and flycatchers. Overall it has a drab greenish topside and whitish underside but with prominent white and black wing bars. The white bars are higher up the shoulder immediately followed by a black bar just below the lower one. No other bird has such wing bars. During breeding season the male's ruby crown is sometimes displayed further confirming identification. In the two photos a Ruby Crowned Kinglet is feeding in the manner described above, One photo shows the kinglet flitting ; the other shows the kinglet perched and reaching up the underside of the leaves for gnats and other small insects. Although the pictures are not that crisp the wing bars are clearly visible in the photo of the perched bird. Refer to a bird book for further field marks. The summer weather is still holding providing farmers with some great harvesting conditions. Let's hope it holds. It also provides for some good warm weather birding. 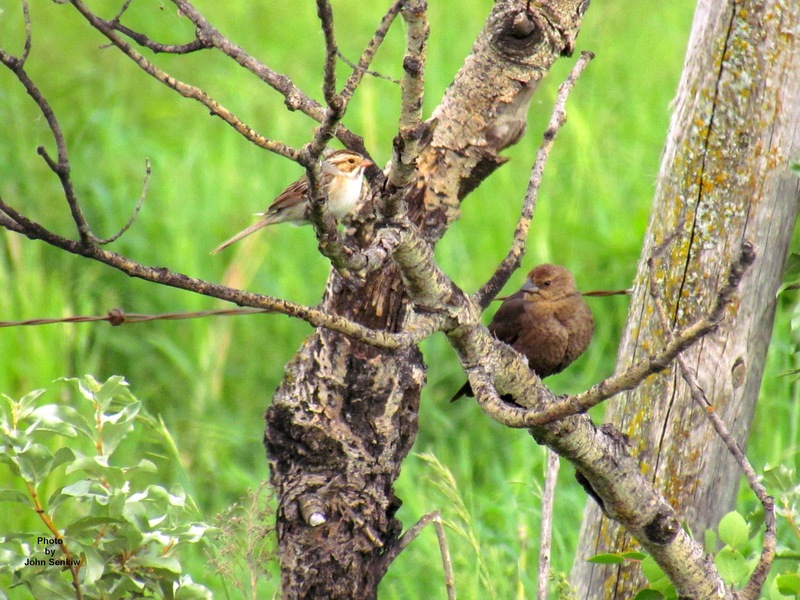 In last week's article one of the pictures showed a Clay Coloured Sparrow sitting beside a Brown Headed Cowbird. This commonly overlooked sparrow is actually quite common and any effort to find and observe one will usually be successful. 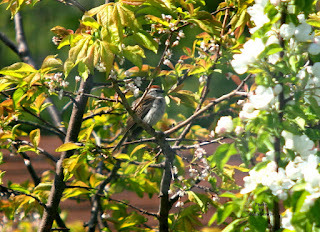 They are more rural than the Chipping Sparrows but are often seen in towns in spring and on occasion will even nest there if there is a fairly decent size clump of trees and shrubs. The Clay Coloured Sparrow is quite nondescript and requires a bit of practice to identify it readily. In the summer time it looks a lot like a Chipping Sparrow except it does not have the red cap nor black eye line. Instead, it has a brown cap with a whitish line running through it and a black "mustache" rather than an eye line. Upon closer examination with binoculars the clay coloured nape clearly stands out and is a definitive field mark. To my way of thinking it might have been better to have named it the Clay Collared Sparrow. In the fall the Clay Coloured Sparrow looks very much like a juvenile Chipping Sparrow so care must be taken when identifying the birds. In the summer time the best field mark is the song. Its song is a rather long (tow or three seconds) buzz in one pitch that sounds much like a very loud grasshopper. No other bird has a song like it. Males and females are the same. This week's photo was taken in our back yard a few years ago. In a colour photo the clay coloured nape is clearly visible. With the plentiful rains these past several summers our sloughs are full and many have not dried out by the late summer. 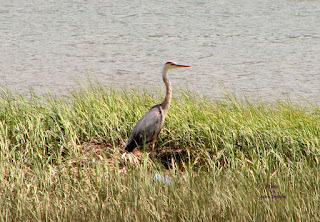 These conditions are ideal for water birds that require permanent bodies of water during the breeding and rearing season. One group of such birds are the grebes. They are entirely aquatic birds whose legs are set so far back that walking on land is very difficult and in two cases, impossible. 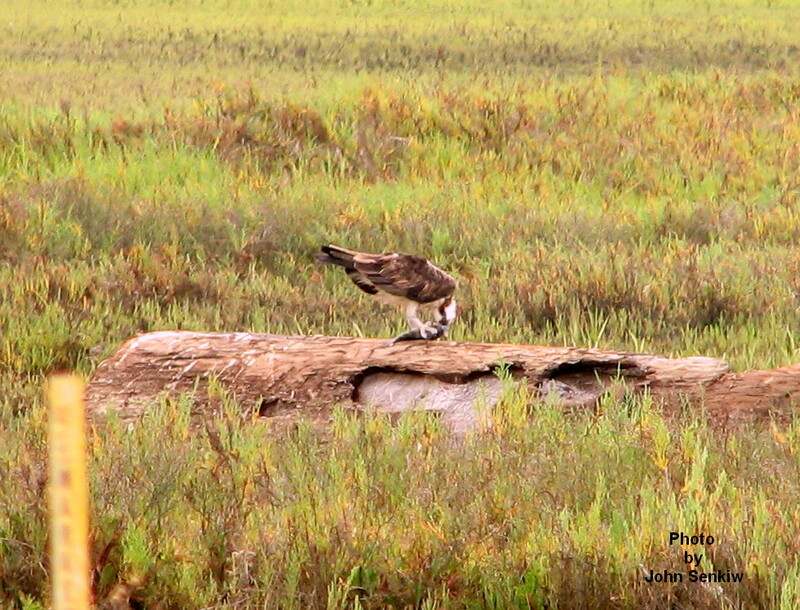 Even their nests are floating platforms that are anchored to rushes to prevent their floating away. Although much of what will be said here was mentioned in a previous article a recap is probably in order. There are several characteristics that separate grebes from other waterfowl like ducks, coots and loons. First, although the birds are entirely aquatic their feet are not webbed but lobed like that of coots. Second, all young are striped longitudinally in black and white. They remind me of little zebras. Third, the young often ride on their mother's backs. Fourth, the young cannot feed themselves so both parents actively feed their young like song birds do. 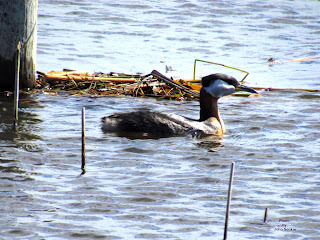 Fifth, grebes are divers and usually catch their prey like minnows under water. Sixth, their bills are sharply pointed except for the Pied Billed Grebe (see Article No. 53). Several other species of birds share one or several of the above characteristics but not all of them. 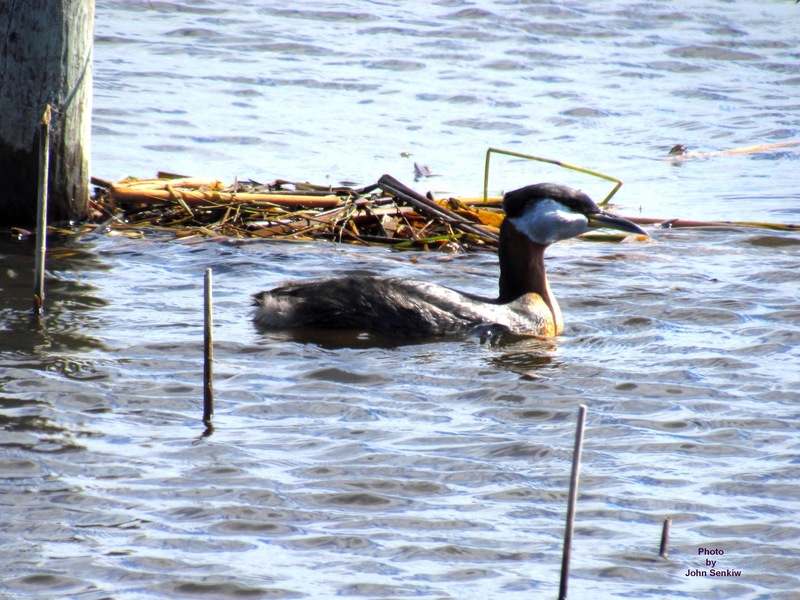 Our second largest grebe, the Red Necked, is quite common locally on larger sloughs and lakes. This teal sized diver is greyish with a chestnut red neck and striking white face topped off with a black cap and slight crest. The white face is more noticeable than the red neck and perhaps the bird should have been called the "White Faced Grebe". Just a thought. Males and females are the same. This week's photos were taken at two different times in two different places. 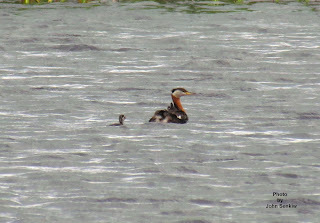 The lone grebe was photographed north of Humboldt; the mother with the two young were photographed by Tuffnell. 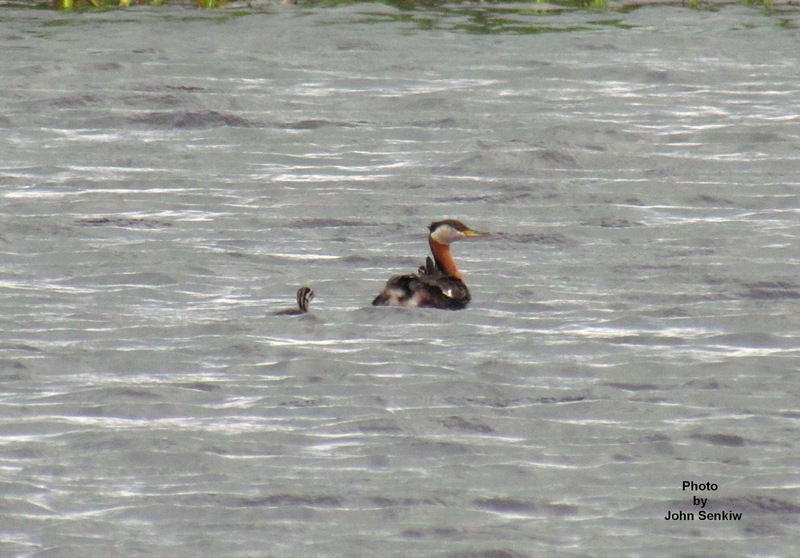 The picture of the mother and young is not as clear as I would have liked but it does show the colours of the swimming youngster. If one looks closely another youngster can be seen riding on the mother's back. The young certainly are cute. The first signs of autumn are here. The Golden Rod in our yard is blooming which has always reminded me that a new school year was about to begin. Some grain fields are starting to turn and some of our summer birds, like the Yellow Warbler and Purple Martin, have already started heading south. Finally, as I was writing this article, a Swainson's Thrush landed on the railing in our garden. These thrushes nest in the boreal Forest and are found here only in the fall and spring during their migration. However, summer is still officially here and so discussion about another summer bird is in order. In the last article I mentioned that the nests of many small song birds were parasitized by the Brown Headed Cowbird, Canada's only completely parasitic bird. In the southern US there are two more cowbirds along the Mexican border. As a point of interest, Eurasia has the Cuckoo (the bird of the cuckoo clock). We do have some other birds that are occasionally parasitic but, unlike the cowbirds, they do build their own nests and rear their own young. Since the arrival of Europeans to the Americas the Brown Headed Cowbird has "morphed" from a unique and interesting bird to a bit of a pest. Historically, the cowbird has had a symbiotic relationship with the vast roving herds of bison (buffalo) and antelope. As the herds roamed about the continent the cowbirds moved with them making traditional nesting and rearing of young impossible. As a result they became parasitic (lay their eggs in other birds' nests). Whenever bison were present in a certain area in the spring the cowbirds would parasitize the nests in that particular area and then move on with the herd. Next spring the herds would be in a different area and the nests in that area would be parasitized and so on. This constant roaming minimized the harm caused by parasitism. Since the disappearance of the bison the cowbirds have switched their attention to cattle which do not roam. Since the cowbirds no longer roam they parasitize the same areas year after year causing considerable problems especially for species at risk. The cowbird's egg (she lays only one) hatches out earlier than those of the host bird usually resulting in the cowbird being the only chick hatched. It is not uncommon to see two 'tiny" Chipping Sparrows feeding a very much larger dark grey juvenile cowbird. To reduce parasitism authorities have had to occasionally exterminate cowbirds in order to restore the reproductive capabilities of threatened species. However, one recent turn of events has led to some unintended control of cowbird parasitism. Many farmers have gotten out of the cattle business leaving large tracts of land without suitable habitat (no cattle) for the cowbirds with the resultant reduction of parasitism. The sparrow sized Brown Headed Cowbird is quite easy to identify. The males are pure black with a distinctive brown head; the females are an even dark brown. To see cow birds, especially males, one has to drive out into the country and find a herd of grazing cattle. The cowbirds are almost sure to be there. In spring, the females can often be seen in town clambering in the shrubs and bushes looking for nests in which to lay their eggs, often being harassed by potential host birds. Both of this week's photos were taken last year several miles east of Foam Lake near some pasturing bulls. 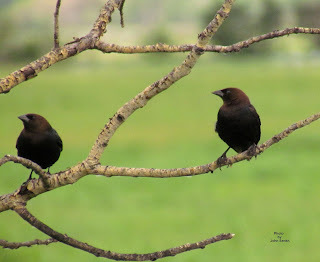 One picture shows two male cowbirds; the other shows a female cowbird and a Clay Coloured Sparrow. I am not sure how well the distinctive features will show up in a black and white photo but a bird book will help. After the deluge of several weeks ago (two inches in thirty minutes) we lost our Yellow Warbler family that I mentioned in my last article. Whether the weather or a predator was responsible is impossible to tell but the young are gone and the nest is abandoned. 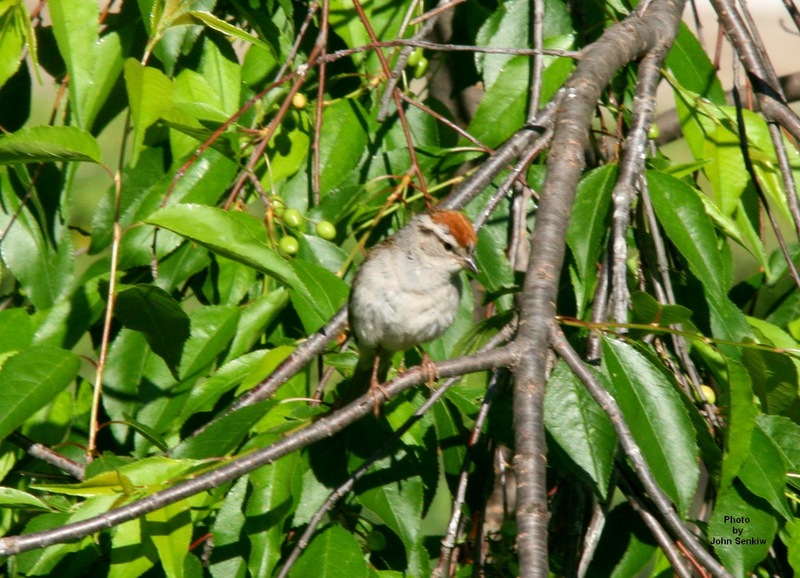 Another pleasant little bird that is commonly found in urban yards is the Chipping Sparrow. 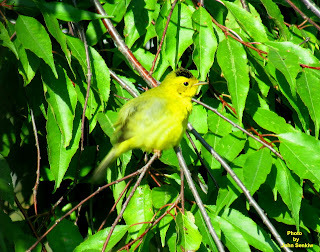 Like the Yellow Warbler it seems to like being in the presence of man and often nests near buildings. It especially likes building its nest in foundation plantings of cedar and juniper. We have had them nesting in our yard in the past but not this year. Like Yellow Warblers Chipping Sparrows are often parasitized by the Brown Headed Cowbird. Yellow Warblers will usually abandon the nest or build a new one over top of the old one (cowbird's egg and all) thus eliminating the problem of feeding a young cowbird. On the other hand the Chipping Sparrow will hatch and rear the young cowbird. It is not unusual to see two "pint" sized chippers feeding a young cowbird twice their size. As youngsters on the farm my brothers and I would go around from nest to nest and throw out the cowbird's eggs if there were any. I hope the Yellow Warblers and Chipping Sparrows appreciated the effort. 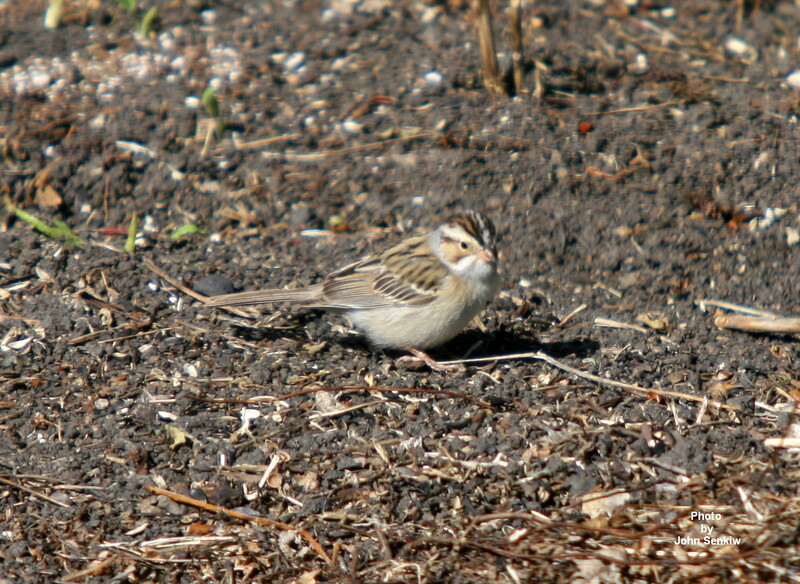 In the summer time the Chipping Sparrow is very easy to identify. It is a small brown bird with plain grey undersides and face, rusty red cap and a thin black line through the eye. 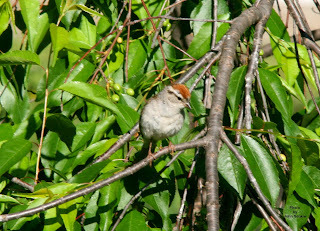 Like all sparrows males and females are the same. There is no other bird like it except during spring migration when it can be confused with the American Tree Sparrow and the Swamp Sparrow that are on their way north. 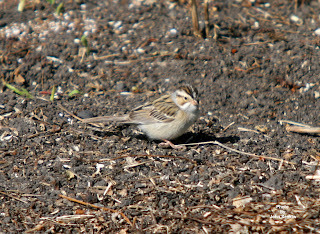 The Swamp Sparrow is a darker bird that is quite secretive staying close to the ground under shrubbery; the American Tree Sparrow is paler with a distinctive black spot in the middle of its breast. Both of these latter two birds prefer rural to urban settings and are seldom seen in town. Probably the easiest way to identify the "Chipper" is by its song. The Chipper's song is a long rattle (two seconds or so) in one pitch. The only other bird that has a very similar song is the Dark Eyed Junco but the two birds are entirely different in appearance so misidentification is not a problem. The Chipper also makes a distinct "chip" sound when calling or disturbed: hence its name. Chippers are often seen on lawns stirring up insects to feed their young. This week's photos were taken in our back yard in the spring a few years ago. One photo clearly shows the colour patterns especially the black eye line; the other is just a good profile. The apple blossoms add appeal. It has been a while since the last article but various family events have kept me busy elsewhere. Now, it is back to local birds. With the plentiful moisture this spring and subsequent heat the vegetation is very lush providing birds with ideal habitat to raise their young. At present we have House Sparrows, House wrens, Purple Martins, Robins and Yellow Warblers nesting in our yard with Brown Thrashers, Brewers Blackbirds, Chipping Sparrows, Grackles and Mourning Doves just a "stone's throw" away. Some species, such as Robins, House Sparrows and Flickers, have fledglings already. A pair of flickers and their four youngsters have been in our yard for a number of days now. With the recent hot weather they have spent a lot of time at our bird bath drinking and bathing. It was fun watching the young ones copying their parents' behavior. It reminded me of little children hesitatingly entering a swimming pool for the first time. After the bird bath they flew to the ground looking for their favourite food, ants. What a nice way to get rid of troublesome pests. As I mentioned in a previous article, "I do like Flickers". This week I am featuring a bird, the Yellow Warbler, that I had covered before in Article No. 89. 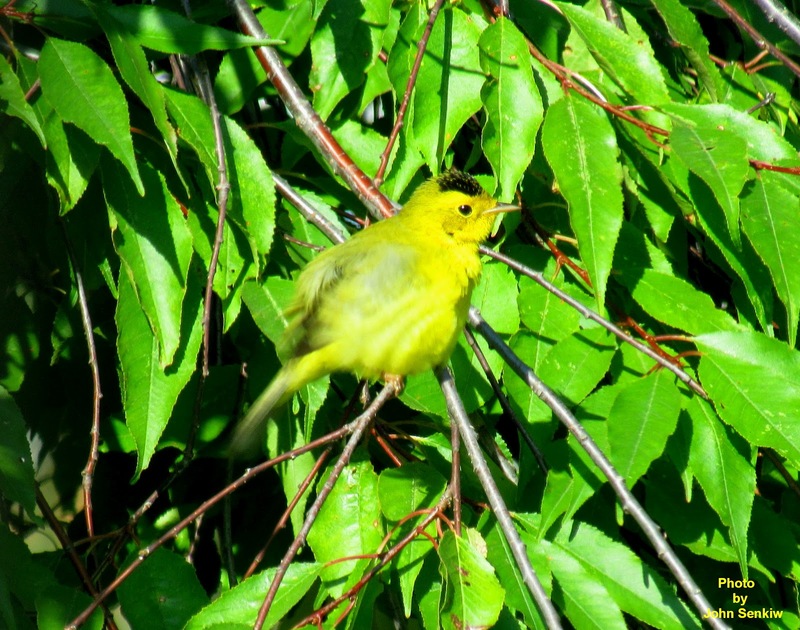 As I had mentioned in that article the Yellow Warbler is the only warbler that can be commonly found in urban yards. We have had their nests in our yard in the past and we have one again this year. This year's nest is very close to our house only about a foot away from our dining room window. Whenever we sit down for meals we can and do watch the parents busily feeding the young. It certainly provides us with quite a bit of entertainment. 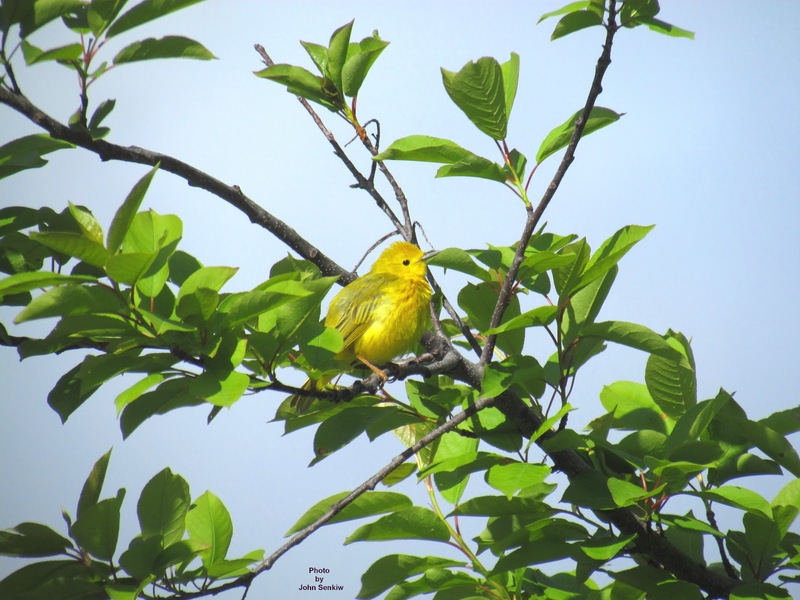 Because of its vibrant yellow colour and cheerful song the Yellow Warbler has always been my summertime "happy bird" as it were. Even in inclement weather its presence raises one's spirits. So it is with this week's picture of a male drying himself off after one of our recent intermittent rain showers. In keeping with our California desert theme I decided to write about one of the most common and conspicuous of our desert birds, the Cactus Wren. 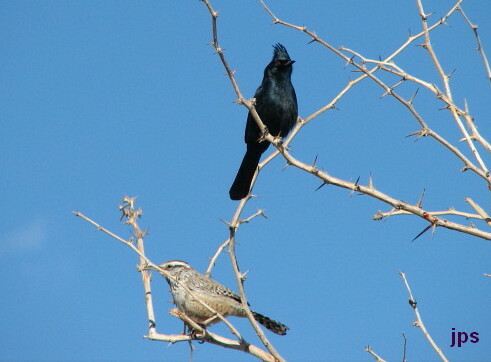 It is more of a true desert inhabitant than either the Black Phoebe or the Phainopepla discussed in the previous two articles, but still, it is often seen in the same locales as these two species. I am rather fortunate in that I have seen eight of the nine species of wrens that occur in North America. 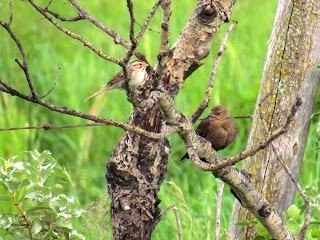 The odd thing is that the one species that I have not seen, the Sedge Wren, is found in the Foam Lake area. Eight of the nine species of wrens are small chunky birds with short tails and the males of all eight sit on open perches and sing loudly claiming their territory. The Cactus Wren is different in almost all ways from other members of its family. First, it is a giant compared to the others being about halfway between a sparrow and robin in size. Second, it is not a songster in any sense of the word. Rather, it makes a kind of grunting or chugging sound as it forages. An interesting characteristic is that it prefers to nest in the very dense and prickly Cholla Cactus which explains the origin of the bird’s name. In terms of field marks it looks like a short tailed thrasher for which it is often mistaken. That is, it is a mottled brown and white bird with a rather long down curved bill. Its only distinguishing mark is a pronounced white eyebrow line. 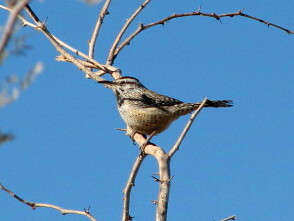 Unlike thrashers the Cactus Wren is quite confiding and seems to like living close to man. It is not uncommon to see one or several wrens running across a paved parking lot, penguin-like, chasing after something to eat. Like thrashers they like to flip over dead leaves in order to expose something tasty. Their primary food is insects but they will catch small lizards and literally beat them to death by swinging them against something hard like a rock, brick or pavement. I have seen all of this take place within a few metres of where I was standing. This week’s pictures were taken several years ago in two different places. 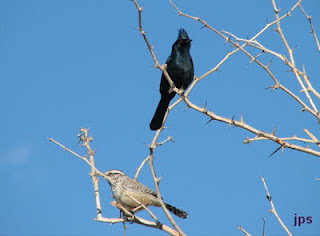 The photo of the lone wren was taken in Arizona; the photo of the Cactus Wren and Phainopepla sharing a snag was taken in California. I included the second photo simply because I liked it.